I continue to work on my tortilla making. I have not yet figured out how to make corn tortillas that do not spilt when we have fajitas. I have tried adding more water, adding olive oil, and even adding (horrors!) vegetable shortening. All to no avail. I refuse to add lard, by the way. So, I thought, maybe try flour tortillas. I found three flour tortilla recipes which I saved. I tried this one. I cut the recipe in half and used fresh milk rather than dried. I used my tortilla press rather than a rolling pin (of course). 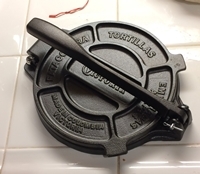 I pressed the press as hard as I could, but the tortillas still came out thick. They didn’t split, to be sure, but they were too thick for tortillas. I told Terry that if we make falafels again we know how to make our own pita bread.